With Metro Vancouver real estate prices soaring 40% over the past two years the effects are widespread. Adding to it, BC property tax assessments released earlier this month are now factoring in an average increase of 30-50% from last year alone. It appears locals are at a boiling point as the struggle to put a roof over your head reaches dire proportions. Take for example, Sarah Wilson, a retired school teacher who just got hit with a 55% increase in her Coquitlam home assessment. Now fearing further increases in her cost of living during her retirement years. But Sarah and her little Coquitlam home aren’t the only ones, property assessments have surged across the lower mainland. As home values explode across the lower mainland and wages stagnate, property tax deferrals have become increasingly common. Property tax deferrals are an option that allows homeowners to defer paying their property taxes as long as they pay the 0.7% interest rate if you’re 55 and older, or if you have children a 2.7% interest rate applies. 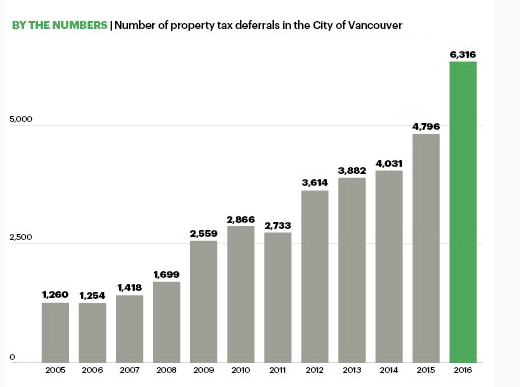 To little surprise, property tax deferrals have increased five fold over the past 10 years. More than $137 million in property taxes are unpaid and growing. As the housing squeeze reaches epic proportions it appears many Vancouverites are at their wits end. According to a new study conducted by Insights West, a staggering 34% of Metro Vancouver homeowners say they are planning to sell their homes and move to more affordable markets in the next five years. Perhaps even more concerning is the fact that 40% of people aged 35-54 plan on moving.